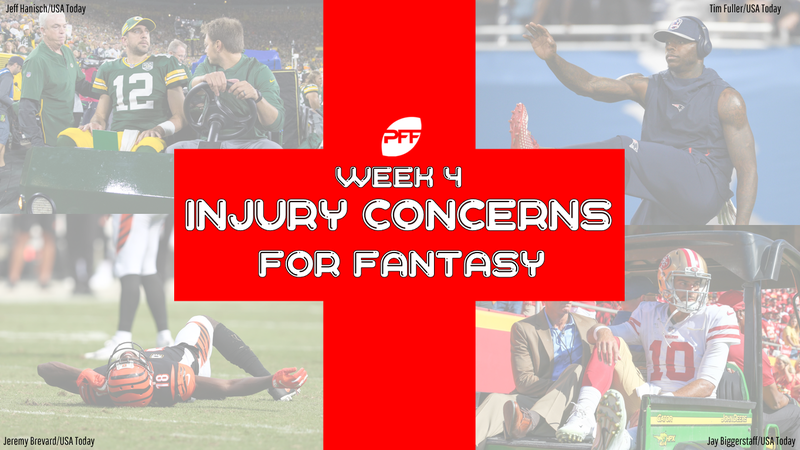 Injuries are an unfortunate reality in football, which means they are also something we have to deal with in fantasy football. Today, we’re looking at the pressing injury concerns in Week 4 of the NFL season. Not even the most expertly drafted fantasy roster is immune to injuries. Every owner is going to have to surf the waiver wire for replacement production at some point this season – if your time hasn’t come yet, it will. This fantasy football injury report will serve as your one-stop shop for injury updates, waiver wire ideas, and start/sit recommendations. Always keep in mind when a specific game is being played — put your non-early slate question-mark players in the flex spot to give you the most flexibility if he ends up inactive. QB: Andrew Luck (groin) — Luck is listed on the injury report but is practicing in full. RB: Marlon Mack (hamstring) — Though limited, Mack has been involved in practice this week and is expected to play this weekend. WR: DeAndre Hopkins (thumb, ankle, hamstring), Will Fuller (hamstring), Bruce Ellington (IR), Keke Coutee (returning from hamstring injury) — Hopkins and Fuller were limited in practice Wednesday but are expected to play Sunday. Ellington was lost for the season due to a hamstring injury – if you were stashing him in deeper leagues he can be dropped and replaced with Coutee, who is ready to return from his own hamstring injury. TE: Eric Ebron (shoulder, knee), Jack Doyle (hip) — Ebron and Doyle were both held out of practice on Wednesday. Ebron is expected to play, while Doyle could reportedly miss several more weeks. Sunday morning update: Hopkins, Fuller, and Coutee are all playing. Ebron is playing and Doyle is officially out. Mack’s hamstring is still limiting him and now he is not expected to play. Jordan Wilkins and Nyheim Hines will get the work. QB: Aaron Rodgers (knee) — Rodgers missed Wednesday practice as he continues to nurse the knee injury he suffered in Week 1. He is fully expected to suit up against the Bills. RB: LeSean McCoy (returning from rib injury) — McCoy missed last week’s contest but is practicing again and has already stated he will be playing this week. You’re playing McCoy in this one. TE: Jimmy Graham (knee) — Graham missed Wednesday practice. There isn’t much info being disclosed about his injury, so watch closely for updates. Consider adding Benjamin Watson or Ricky Seals-Jones as insurance since they play in later games. Sunday morning update: Graham is suiting up Sunday and should provide TE1 numbers in the Packers’ date with the Bills. WR: Anthony Miller (shoulder) — Miller is still recovering and the Bears have only proven to be able to support one pass-catching option for fantasy purposes thus far. I think he could supplant Taylor Gabriel once he’s healthy, but for now Miller is best treated as a “watch list” player to be claimed at a later date. QB: Ryan Tannehill (shoulder) — He’s practicing in full, but make note that this injury is to his throwing shoulder. RB: Rex Burkhead (placed on IR) — Burkhead was placed on IR, ending his season. Potential waiver wire replacements include Javorius Allen, Duke Johnson Jr., and Aaron Jones. WR: Josh Gordon (hamstring) — Gordon missed Week 3 due to the injury and needing to get up to speed after being traded. He practiced Wednesday in a limited capacity. The Patriots have struggled to find rhythm and explosive plays this season. The problem is, even if he plays, he’s likely going to draw Xavien Howard, who has rendered opposing WRs completely useless so far this season. Gordon is merely a desperation play this week. TE: Rob Gronkowski (ankle) — Gronk practiced Wednesday. There is no way he’s sitting this week as the Patriots can’t afford to fall three games behind the Dolphins in the division. RB: Joe Mixon (DNP, knee) — Mixon didn’t practice Wednesday but is reportedly close to returning. He’s still a long shot to play this week and is best left on the bench until Week 5. WR: A.J. Green (pelvis) — Green is now on track to play this week despite initial pessimism about his injury. He practiced Wednesday. If you own Green and he’s active, you’ve got to start him. The Falcons are ranked in the bottom-half of the league in points allowed to opposing wide receivers per-game and Green is off to a strong start this season. Sunday morning update: Green was removed from the injury report and will play. Start him with confidence. RB: Leonard Fournette (hamstring), T.J. Yeldon (ankle) — These two have switched places, as Fournette looks ready to play and Yeldon will likely miss this week’s contest. Fournette is a solid start in a home matchup as a favorite. If you have roster space, Corey Grant is an interesting speculative add in case Fournette has a setback. Grant would be in a smash spot with Fournette and Yeldon both on the sidelines. Sunday morning update: Fournette is playing and should be in your lineup. Yeldon was also removed from the injury report but is now a much less attractive option as he’ll just be getting change-of-pace duties. He’s merely a flex consideration but I’d look elsewhere if at all possible. RB: Jay Ajayi (back) — Ajayi missed Week 3 with this injury and still isn’t practicing. Even if he’s cleared, it would be tough to trust Ajayi in his first game back as the team likely wouldn’t overload him with volume. WR: Alshon Jeffery (shoulder) — Jeffery is practicing in full and will be starting this weekend. You’re starting him. Sunday morning update: Jeffery owners just can’t catch a break. He is now listed as questionable with an undisclosed illness. He only ended up practicing once this week. I’d play it safe and sit him. WR: Amari Cooper (ego) — Just kidding. Wanted to make sure you were still paying attention. WR: Doug Baldwin (knee), Larry Fitzgerald (hamstring) — Baldwin practiced on Wednesday (limited) and could start this weekend. Depending on your other available options, Baldwin is a potential option this week for a Seahawks team that is absolutely starved for playmakers. Ideally, you’d sit him and use this week as a “prove it” contest. … Fitzgerald didn’t practice Wednesday but is expected to play. Hopefully he will see more volume in a new-look offense with Josh Rosen under center this week. Sunday morning update: Chris Carson was listed as a game-time decision on Friday, but is now reportedly “fine,” per head coach Pete Carroll. Play Carson in this plus matchup against Arizona. Sunday morning update: Baldwin is likely to play. If you have another option (especially if you’re favored and just need a solid floor play), I’d still prefer you use it because we don’t know if he is truly 100%. If you are a big underdog or don’t have another great option, then play Baldwin. Sunday morning update: Fitzgerald is playing. TE: Evan Engram (knee) — Engram will be out for the next few weeks with a knee injury. Consider adding Benjamin Watson or Ricky Seals-Jones as preferred fill-in options. The Saints listed a number of players as limited on Wednesday, but there aren’t any serious threats to missed time among viable fantasy starters. QB: Jimmy Garoppolo (IR) — You can drop him in redraft leagues, he’s out for the season. RB: Matt Breida (knee) — He played through the injury on Sunday (and produced). I expect him to play this weekend and you can start him with confidence as the 49ers should lean more heavily on the run game with their backup quarterback at the helm. Breida could also see increased receiving duties – C.J. Beathard famously propped up Carlos Hyde in 2017. WR: Marquise Goodwin (quad) — Goodwin was limited Wednesday. I’m sitting all 49ers pass-catchers not named George Kittle until we see what the 2018 version of Beathard looks like. Sunday morning update: Goodwin is no longer on the injury report. He should be downgraded because of Beathard starting, but you can use him if desperate for a flex player. WR: JuJu Smith-Schuster (abdomen) — He didn’t practice Wednesday. There aren’t any whispers of him missing the game at this point, but this situation bears close monitoring. TE: Hayden Hurst (returning from foot injury) — Hurst will see his first action of the season this week but shouldn’t be trusted for fantasy purposes yet. Sunday morning update: JuJu will be on the field.